One of Europe’s finest golf resorts, yet still great value – Le Meridien Penina should be top of every golfer’s “to visit” list – join our golf group there in January 2019! Penina has been voted “Portugal’s Leading Golf Resort” and “Portugal’s Leading Resort” at the World Travel Awards. Le Meridien Penina is a top quality golf resort that, once visited, guests return to year after year. This stylish resort is renowned for its wonderful, relaxed atmosphere where guests are always welcomed and made to feel instantly at home in the elegant yet comfortable surroundings. The first golf course to be built in the Algarve in 1966, the Penina Championship Course is considered one of the finest creations of Sir Henry Cotton, 3 times champion of the British Open. Built on land that was originally used for growing rice, Cotton planted over 360,000 trees to create the wonderful wooded feel the course possesses. The first tee is just a few yards from the hotel, and the gently rolling fairways are well manicured, and scattered with well placed hazards to pass before you reach the greens which are always in great condition. A magnificent course that is justifiably proud of its reputation as one of the Algarve’s finest. Our golf week includes 5 rounds of organised competitions, however, if you fancy a change from the Championship Course, the resort also features an excellent 9-hole Resort Course, ideal for brushing up on your short game, and the 9-hole Academy Course which is linked to the excellent teaching facilities that are available here, which include a new driving range which is already considered to be one of the best in Europe. This quality hotel is set in 360 acres of grounds and overlooks perhaps the most famous course in Portugal. 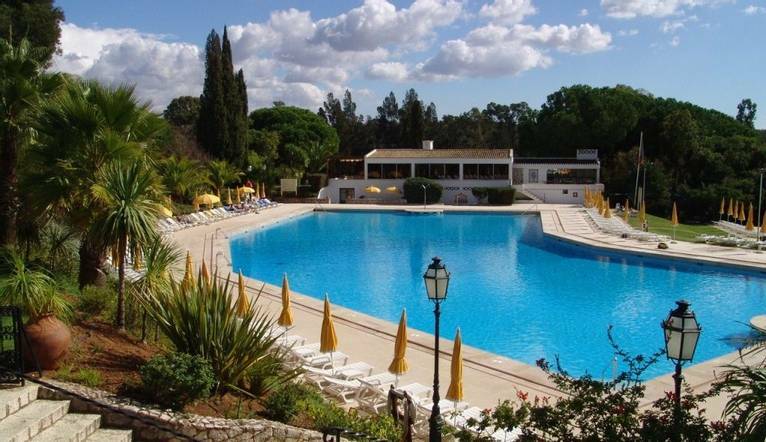 The hotel’s great facilities include a superb, large outdoor pool with spacious sundecks, as well as a health centre, tennis courts and bicycle hire. In the evenings, the lively Sir Henry Cotton’s Club is the perfect venue for an aperitif before dinner as tales from the previous day’s golf abound. All of the beautifully furnished rooms feature a private terrace/ balcony, satellite TV, telephone, internet air-conditioning, minibar and safe. The transfer time from Faro Airport to the Penina Hotel & Golf Resort is approximately 30 minutes, depending on weather and traffic. In addition, it is possible to play 9 holes daily on Penina’s Resort and Academy Courses. This trip is for golfers with a handicap of 36 or lower for ladies and 28 or lower for gentlemen. Please advise our Reservations team of your handicap at the time of booking, alternatively you can add this to the special requirements box on our booking page. If you have a certificate please ensure you take it with you on the trip, this enables the Tour Leader to assess everyone’s ability, so that rounds and competitions can be organised fairly. If you are uncertain about these requirements please do not hesitate to contact us. We will be happy to advise you. Clients will most probably find that their golf clubs are covered on their household insurance policy. Most policies cover a single item such as golf clubs for a period out of the country. However, clients should make very sure that they do have cover. If not, Solo’s Holidays insurance includes cover for golf clubs and bag. Most golf clubs have these items available for hire, however this is not always the case, so clients would be advised to check with us beforehand if they have any specific requirements. Golf shoes with soft spikes are required. We advise you to use a light golf bag when packing your clubs. We suggest you wrap a towel round the neck of the clubs to protect them and stop them rattling around whilst in transit. It is also important to then place the bag and clubs in an outer carrying bag, which can be purchased from any good golf shop. Golf attire during the day. We suggest smart casual for the evenings. We suggest a Group Collection to cover transfer drivers, and hotel staff of €15.00 per person. Your Tour Leader will collect this on your behalf and distribute it accordingly, thus relieving you of the burden of who, when and how much to tip. The tipping of housekeeping will be left to your individual discretion (a small amount left in your room on departure should cover this and would be much appreciated). As is customary, ‘the hat’ will be passed around for the driver and guide on all optional excursions. For any meals that are not included in your itinerary, or taxi fares, your Tour Leader can advise of an appropriate % to add on. A full 10-year passport is required valid for at least the duration of your stay. Holders of passports with the inscription “British Citizen” or “European Union” do not require a visa.